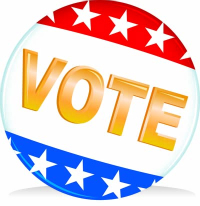 The Village of Downers Grove will be an early voting site for the April 2, 2019, Consolidated Election. Early voting outside the Election Commission will begin Monday, March 18, 2019 through Saturday, March 30, 2019, in the Committee Room at Village Hall, 801 Burlington Avenue. The hours for early voting will be Monday through Friday from 8:30 a.m. to 7:30 p.m. and Saturday from 9:00 a.m. to 5:00 p.m. Please contact the DuPage County Election Commission at (630) 407-5600 or April Holden, Village Clerk, at 434-5535 for further information about early voting. Downers Grove Township offices, 4340 Prince St.
"Grace Period" voting, allowing individuals to register or update their registration and vote at the same time for those who did not register before the traditional deadline, will be held at the Election Commissioner Office, 421 N. County Farm Road, Wheaton beginning March 6, 2019. Please call the Election Commission at (630) 407-5600 for more information about "Grace Period" voting.